Excellent portrayal of Super Speed, and strong use of lettering, colour, and light in the artwork. Insight into Barry’s character: change and potential in his future selfs actions and attitudes. Unusual Time Travel perspectives and broad, science fiction ideas. Light, electricity, and lightning crackle across the pages of this comic. Super Speed is portrayed through interesting art choices, later in the comic book. The best art choices arrive late in the comic. It’s the introduction of a second time traveler that brings a interesting change in the art choices. Up until that point, the comic book had show off super speed as blurred fists and feet, and repeated images of The Flash and his future self running. This character has one particular panel that shows off how super speed can work. Future Barry makes a final move against the present Barry. He tosses pebbles. They fly as fast as bullets. In one panel the character notices the tine stones, reaches out to stop them, and then activates his powers and outruns them, stopping the pebbles from reaching Barry. These actions all occur in one panel, representing barely a second of time passing. Essentially, this hero has caught the pebbles at the same time he has noticed them. The panels effectively captures how quickly a character with super speed moves – faster than sound, arriving before his voice finishes travelling through the air. While it’s a spoiler to reveal this character’s identity, the portrayal of their speed is effective. The red clothed Barry Allen of the present, and the electric blue Barry from the future, stage their battle on a desolate plain of white salt flats. Lightning and electricity crackle across all the panels after the opening scenes, and stay for the remainder of the comic. Pages of red, yellow, and blue electricity fly across panels accompanied by giant, electric lettering. Barry is contrasted with his future self, who has lowered himself into cynicism. Compared to his past self, Future Barry does not respect the criminal justice system, and believes in violence as a solution for his problems. Before the battle begins, Barry of the present eats cereal for breakfast. He chooses “refined sugars and process grains”. Not a great choice for breakfast – The Flash’s metabolic rate might allow him to eat whatever calories he needs, but it’s not the best example to set. It is an interesting comment that Barry’s future self effectively stops him from eating the sugar-coated cereal. This raises the question of if time travel were possible, would we stop our past selves eating unhealthy food choices? Barry and Future Barry also fight over lethal force. Future Barry has concluded that arresting criminals and seeking rehabilitation for them – what he calls “virtue” is not enough. Villains continue to re-offend, and murder. He has reached the extreme point of rejecting the criminal justice system. The comic book explores large science fiction concepts and perspective more than deeper themes. Speed Force as exotic matter appears alongside an interesting perspective on time travel. The plot of the comic relies on the exotic matter of the Speed Force. Fixing the broken Speed Force drives Future-Barry’s actions. Repairing the damage involved applying more Speed Force to the Speed Force problem. Despite the re-use of Speed Force throughout the comic to explain the problems and provide solutions, the comic book provides entertaining science fiction. Time as portrayed in this comic book does not fit into Back to the Future rules. Barry’s death in the present would not wipe away this future version of himself. Time travel ideas here are difficult to conceptualise. How would a paradox not happen if the younger Barry was killed? Would Future Barry necessarily fade out of existence rapidly? It’s an interesting perspective – looking at time not as a cause and effect, with a series of linear events, but as a more abstract concept. It’s difficult to see time as a larger, interconnected web, or any shape other than a chain of linked events. The Flash #35 is published by DC Comics ($2.99USD). Robert Venditti & Van Jensen (W.) Brett Booth (P.) Norm Rapmund (I.) Andrew Dalhouse (C.) Dezi Sienty (L.) Cover artwork by Booth, Rapmund, Dalhouse. Capturing fine details, the comic sets effective scenes, and employs good character body language. Both quiet scenes and loud scenes have a sense of silence and volume respectively. Colour choices are strong here. In the distant future, Dr. Hank McCoy ruffles his blue fur. He hangs from the ceiling of his quiet laboratory, scrawling chalk notes across a blackboard. The attention to detail here is strong. Easter eggs from X-men history are dotted within the complex notes. The artwork establishes McCoy’s impossible puzzle. He brought young X-men from the past into the present day. Now, in an alternate future he created after those events, he cannot solve the problem. The young X-men were not returned to the moment in time they left, and reality broke as a result. In a powerful flash forward to the future, The X-men and the brotherhood featured in Battle of the Atom clash. 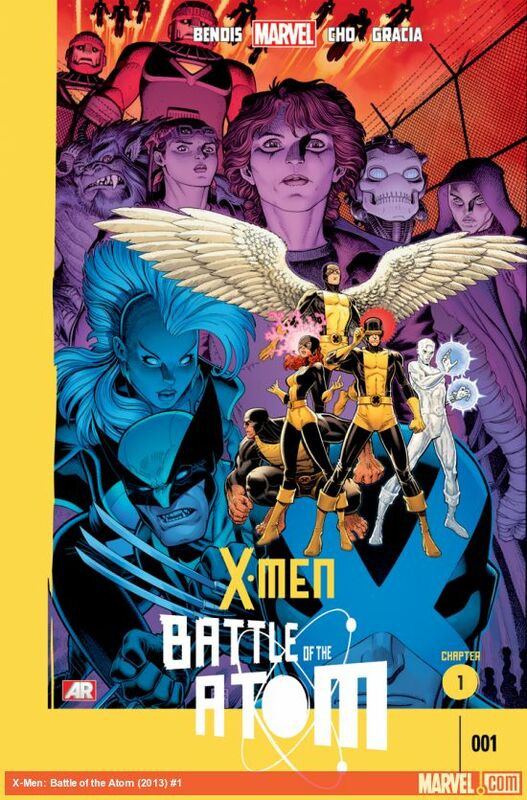 In two pages, a large scale artwork depicts older, wiser X-men facing off against an upstart brotherhood. Pale blue and purple energies glow, while swords shine through the air. Dialogue centres around two brothers: Xavier junior, and Raze. Xavier’s struggle to make the X-men understand how badly his father, Charles Xavier, was treated forms the key conflict of the comic book. There are some hilarious comments in the dialogue featured across the opening scenes. Old Beast, in the far future, meets young Xavier Junior and Raze – founders of the new, upstart brotherhood. These young men are in fact brothers. Their mother is the blue, shape-shifting Mystique. Their fathers are Charles Xavier and Wolverine respectively. Xavier meeting with young Jean Grey presents a chance to bring out his backstory. It’s a major point of conflict. His father died fostering the X-men despite all the efforts Charles Xavier delivered in growing, expanding, and safeguarding the X-men. He references the events of Avengers Vs. X-men. His rage grows when he outlines to Jean exactly how frustrated he is that his father’s legacy, house, and fortune where not retained or cared for by the X-men. His Brother Raze is plainly a terrible person. It comes across in the artworks depiction of his body language, and the word choice that creates his character voice. Exploring layers upon layers of time travel, the question this raises is how far can space, time, and the history of the Marvel Universe be pushed? The comic overflows with time travel mechanics. And layering more time travel atop the already teetering stack of time travel events in All New X-men creates confusion. There are not many deep themes here. Moreover, the comic explores the effects of psychic powers, and time travel. The artwork is rich in colour and detail. Character’s speak in their own unique voices. Threats from an alternate future are interesting. The time travel mechanics however, are confusing. 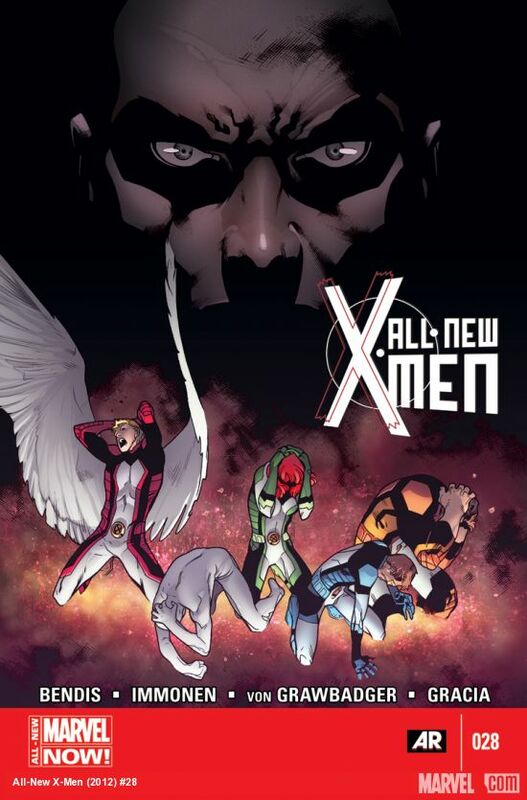 Xavier Junior and Raze decide to travel back in time to initially confront the X-men: if they fail to reach their goal, they will send a message to themselves moments before they left, which allows them to build a new plan, and try again. This causes a paradox: how can they travel back and try a different approach if they now no longer went into the past initially, failed to reach their goal, and sent a message to their future selves? The paradox that emerges pushes an already strained timeline. Is this pushing too hard on space and time in the Marvel Universe? Two popular culture references appear. When asked who his father is, Raze states it is “Batman”. When examining his timeline for gaps, Dr.McCoy mentions the Age of Apocalypse, and the Age of Ultron in. 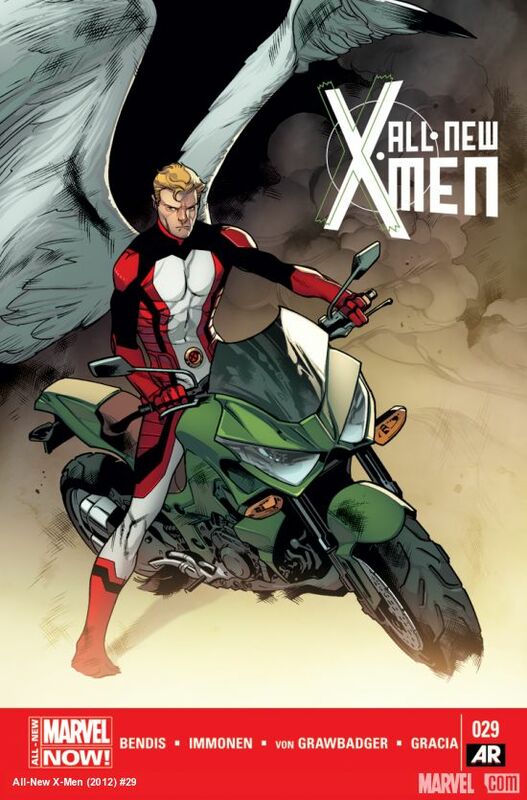 All New X-men #21 is published by Marvel Comics. ($3.99 USD). Brian Michael Bendis (W.) Stuart Immonen (A.) Wade Von Grawbadger (I.) Marte Gracia (C.) VC’s Cory Petit (L.) Cover Artwork by Immonen, Grawbadger, and Gracia. On July 3, 1985, Back to the Future opened in American cinemas. A July release date means the film, with it’s ground breaking and long lasting time travel themes, opened to audiences in the summer. When I was younger, I watched similar movies and read similar comics about characters going on wild adventures, usually during the summer. They left me with a sense of nostalgia and adventure. Rocket Girl #3 gave me a similar feeling. The Back to the Future popular culture link strengthened the story: it recreates the 1980’s strongly with excellent interior art and attention to detail. The first and last themes would be useful to educators looking to teach about power, youth, and responsibility with comics. The comic might be confusing for new readers, however, since the plot might confuse at times. When collected into a trade paperback, and read as a graphic novel, Rocket Girl might make an excellent introduction for readers interested in a new super-hero and time travel themed comic. Rocket Girl is Dayoung Johannsen. Only fifteen years old, Johannsen has an unusual name, and lives in an alternate time. She comes from 2013, a world unlike the 2013 we just experienced: a major corporation called “Quintum” has taken control of New York City, and turned the Police into privately owned law enforcement. Rocket Girl belongs to a Police Force of teenagers. Equipped with powerful technology that can gather information from radio waves and wi-fi, and a small but powerful jet-pack, these young officers bravely defend the law. The comic tells the the story of her current mission: traveling from 2013 back to 1986 to prevent the Quintum from gaining a toehold, which will one day develop into dominance outright. A pop culture link is Trunks from Dragon Ball Z. Just like this young time traveler, Rocket Girl wants to make a few alterations to the past in an attempt to help everyone living in the future. The 1980’s setting is rendered with such authenticity that in a scene where a character sings along to The Final Countdown (by Europe, released February 14, 1986), you can heard the distinct 1980’s sounds. In a two page artwork, Rocket Girl is without her jet-pack, and escapes captivity in a Police Station with clever gymnastics, and Parkour. These action scenes shop off dynamic artwork. In an interview with Comic Book Resources staff writer TJ Dietsch, series creators Brandon Montclare and Amy Reeder talked about the moral decision making they wanted to include in the story. After reading through issue #3, some moral decision making from Rocket Girl herself is clear. There is a question of power, and how power is used. She does not cause excessive damage. She is defensive, but not aggressive. Responding to difficulty, Dayoung shows strength and a desire to help. She accepts help from friends offering it. She does not attempt to work alone. Then there is the Youth versus Age themes. It captures a sense of the generation gap. In the 1960’s, The term “generation gap” was used to describe the unusually large differences in music, fashion, and values observed between younger generations and their elders. A gap is clear in Rocket Girl, which sets up and appears to continue to include scenes and ideas on younger character’s values in opposition to older character’s values. Rocket Girl herself comments to “Never trust anyone over 30”. Clashes between generations abound throughout the comic. Rocket Girl #3 is published by Image Comics. ($3.50 USD). Brandon Montclare (W.) Amy Reeder (A.) Cover artwork by Amy Reeder.